I'll say one thing -- wearing my Groucho mask is great for keeping my nasal passages moist (recommended for my irritated blood vessels there). And it got good laughs at the cancer center. 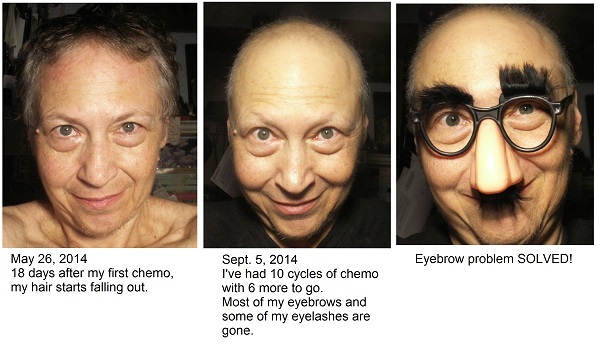 I slipped the mask on before I stepped inside and proudly proclaimed, "I got my eyebrows back!" Unlike last week, there was plenty of parking available and both waiting room and chemo bay were a lot less claustrophobic. It was still a very busy day for the staff, and the chemo bay had filled up by the time I was done. 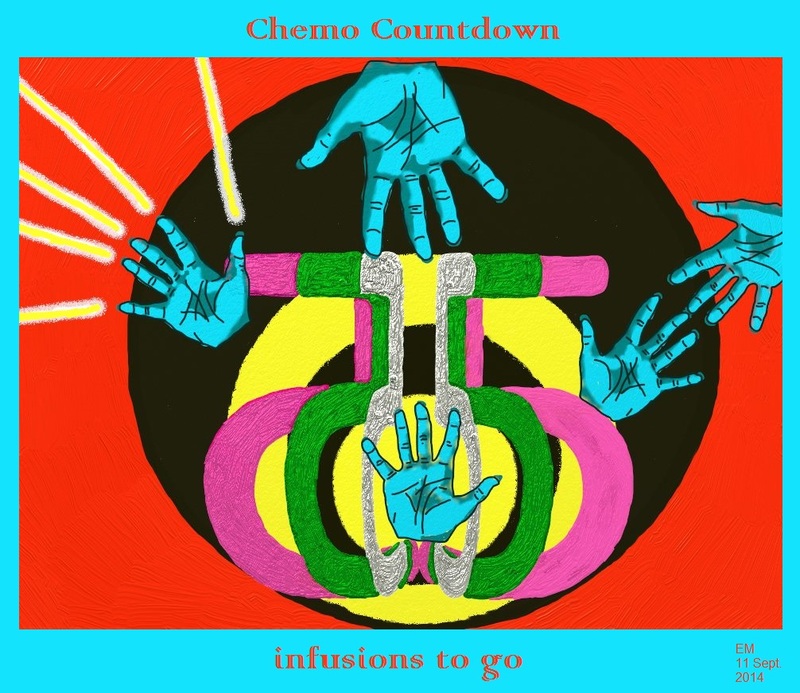 The chemo nurses had been well-informed about my reaction to the iron push last week and were extra careful this time. I received my pre-meds (including Benadryl and saline) 20 minutes prior to the iron, with instructions to report anything out of the ordinary. The push was done more slowly. Unlike last week, when my reaction had occurred after the end of the push, this time it began about halfway through. Once again I got that "strange" feeling, only in my chest area rather than my port area. I still can't describe it adequately. Some pressure, some chills, but also more than that. The nurse stopped the iron push and we waited another 20 minutes for me to recover. She gave me another push of Benadryl, followed by the rest of the iron, which I tolerated well. No cramps, vertigo, nausea, or breathing difficulty this time. Ten minutes after that, she hooked me up to the Taxol. Apparently my reaction to the iron is unusual, though not unheard-of. The particular iron I'm getting (Feraheme) comes with neither a test dose nor a black box warning, according to Sara S. Kim's article, "Managing Intravenous Iron in the Oncology Setting" (Pharmacy Practice News, PDF file). The black box warning advises about a potentially fatal anaphylactic-type reaction. Interestingly, for those iron formulations that come with a black box warning (again, mine is not included in those), diphenhydramine (i.e., Benadryl) is not recommended, because that drug itself can cause an anaphylactic-type reaction. A test dose is used instead. I won't get any Feraheme next week, but we will re-check my iron levels. Am keeping my fingers crossed. My BRCA test results might be in by next week's infusion (if not then, most likely the week after). I keep a handwritten journal in which I talk to myself on paper much of the time. My notes below are based on my journal entry from Sept. 5. I asked myself: What am I looking at if the test results show BRCA mutations? What are my priorities? What would point to a bilateral mastectomy and/or oophorectomy (or hysterectomy)? I want to look at the whole picture. HBOC [hereditary breast and ovarian cancer] doesn't include the uterus, but I am postmenopausal. If for some reason the AIs don't sit well with me and I have to turn to Tamoxifen, uterine cancer is a potential side effect. And my only reason for keeping my uterus -- and a legitimate reason at that -- would be its support of my pelvic floor. Removal can come with surgical complications and post-surgical complications from internal shifting, including potential incontinence. So, need to balance the risks and benefits. The same goes for bilateral mastectomy. That could involve the loss of muscles, tendons, and lymph nodes, thus further lymphedema risk. My upper body strength could be compromised, and thus my ability to perform certain tasks, including those related to caregiving. I would need to consider home health and possible PT, given that I do almost all the household errands. How would my own functionality be impacted? What available local support is there? [My oncologist] needs to know the extent of our isolation and the conditions here at home. He needs to know the full picture, because that factors into the risk/benefit analysis. Quality of life. Emotionally, I would have to adjust to losing my breasts altogether, and also to losing ovaries and maybe uterus. Both are major invasive surgeries; both involve hospital stays. I would need to talk to [a friend], see if she's still okay with holding my POA. 1. Time to make arrangements (e.g., with home health care) if I choose prophylactic surgery, as opposed to the relative rush into surgery should cancer be detected. 2. Time would be on my side for recovery from those surgeries. I'm 55. If I am at risk, do not have surgery, and must face it down the road, I would have a tougher time recovering. Plus, my system would be all the more ravaged from the AIs. (What are the implications of having those surgeries while under AIs?) Again, what's the risk/benefit analysis here? 3. Control, in some form, factors into the two points above. The less time I have to address the issue, the less control I have over it, because cancer does not wait. I want the time and control to assess the risks from action and from inaction. I also want the time and control to present all the aspects of my life that would be impacted by both prophylactic surgeries and surgeries necessitated by cancer in the absence of prophylactic action. This is where my risk numbers are crucial. What justifies prophylactic action versus waiting it out? 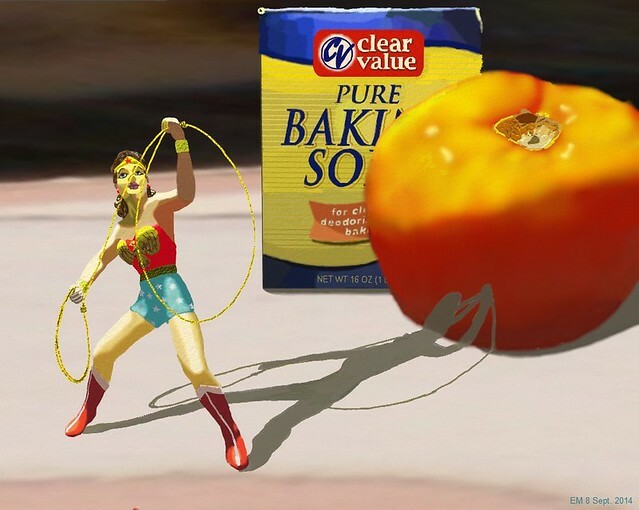 "Still Life With Wonder Woman" -- because we could all use some superpowers. The baking soda, tomato, and Wonder Woman ornament are embellished tracings from my photos. (WW lives in our kitchen.) My model for the tomato is organic produce from our locally-grown farmer's market. I picked it up (with other veggies) after chemo and it was delicious in last weekend's gazpacho. The landscape is a rotated, enlarged, and stretched fragment of an actual photo I took of distortions in a glass brick. The brick belongs to one of our local cafes, where my partner and I had lunched on April 3, nine days after my lumpectomy.